Leading innovators in digital media content, multi-platform designand online business models are lined up for two days of Digital Editors Networkmaster classes, meetings and meetups on October 20th and 21st in Preston. 09:00- 15:00 Master Class: TruthTelling. Have you ever been deceived?In an interview for a new recruit? By a business partner or client? By a colleague? By a news source? The Truth Telling Master Class with Cliff Lansley and Dr Dawn Archer will interest all who are concerned about the validity of what we hear read and see. Cliff is managing director of Paul Ekman International, whichhas been established to make emotional skills and deception detectionprogrammes accessible across the world, and Dawn is Reader in CorpusLinguistics at the Universityof Central Lancashire, where her internationally-rated research includesusing computer aided linguistic analysis to identify implicit/“hidden”messages. 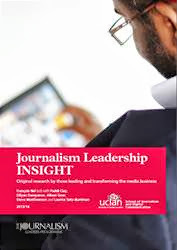 WANT ORIGINAL JOURNALISM LEADERSHIP INSIGHT FROM THE FRONTLINE? Get this free research report by those leading and transforming the media business.